When Anthony Billburg opened his new saloon at 231 20th Street in 1915, he called it the New Billburg, and touted it as the Longest Bar in the World. Previously Billburg had operated a saloon nearby at 221 20th Street while the Bullfrog Buffet operated by Mack Glynn was at 231. The New Billburg was located on the northeast corner of 20th Street and Third Avenue. A vintage photo of the exterior shows an attractive one-story building with a bracketed cornice near the top and white stone trim. The narrow frontage on 20th street had large windows and a corner entrance. The building extended all the way to the alley along the Third Avenue side, punctuated by a doorway in the center of that facade, with small high windows evenly spaced along either side. The postcard shows us a beautiful, indeed elegant, barroom, with a beautifully coffered ceiling. Perhaps there’s a woman’s touch somewhere in that elegance. Anthony Billburg’s Scotland-born wife, Margaret, was an important part of her husband’s business operation, reportedly running a prostitution operation out of the back room. On one occasion Margaret and her girls were arrested and fined. The girls had to pay $15 each, while Margaret was assessed just $5. Billburg’s career as proprietor of this beautiful saloon was short-lived. In 1918, he was forced to shut down. The federal government had decreed that every saloon within a three-mile radius of the Arsenal must close. Although this order was rescinded at the end of the World War I, another setback arose. The new 18th Amendment prohibiting the manufacture and sale of liquor was passed. Billburg, however, had already had a long association with John Looney, Rock Island’s legendary bad man. Looney knew how to ensure that the liquor would keep flowing – and he charged saloon owners a high price to protect their businesses. Although saloon names were changed to reflect a theoretically different business, alcohol continued to flow. But Billburg developed yet another problem. In 1922, he and three other disillusioned former Looney cronies decided to end Looney’s reign once and for all. They tried to ambush Looney and his bodyguard son, Connor. John Looney got away, but Connor was killed. As a result, Billburg was convicted of the crime and sentenced to 20 years in jail. Luckily for him, he was freed before serving a full 20 years, and by the mid 1930s he was back on 20th Street, living upstairs above his old saloon at 231. Margaret, who lived in the apartment while he was in jail, died in 1935. Although Billburg lived until 1950, city directories never indicate that he operated a saloon again. 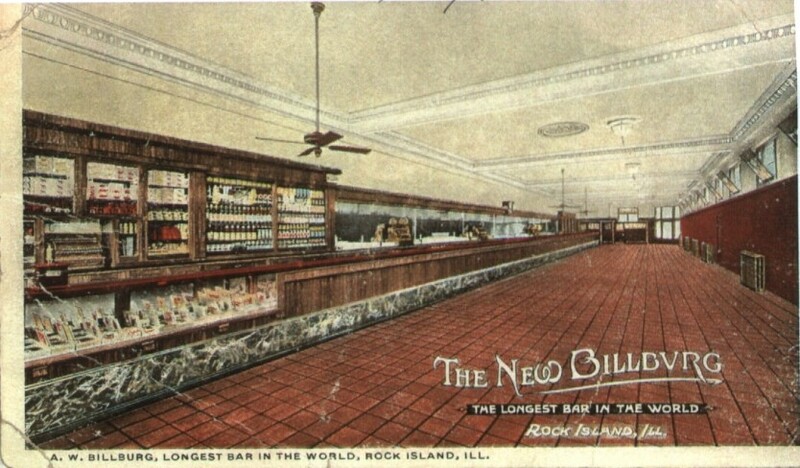 What happened to the building once dubbed “the bar that made Rock Island famous,” the elegant New Billburg? It continued in operation in the 1920s as the Brunswick Billiard Parlor – presumably with no alcohol. In the 1930s, the building was converted into the aptly named “Long Bar” service station, with a repair shop instead of girls in the back, before it was finally demolished for a used car lot. Now? It’s just one corner of a great big parking lot. This article, by Diane Oestreich, was originally published in the Rock Island Argus and Moline Dispatch on March 10, 2002.